City officials, in an effort to drive down gun violence, on Tuesday unveiled plans to deploy more than 200 detectives, spend millions of dollars for DNA experts and set up special courts to handle firearms cases. The new crime initiative, dubbed “Project Fast Track,” will include a new NYPD gun-violence suppression division with orders to ramp up efforts against armed gangs and weapons traffickers and state court judges who will handle nothing but gun cases. 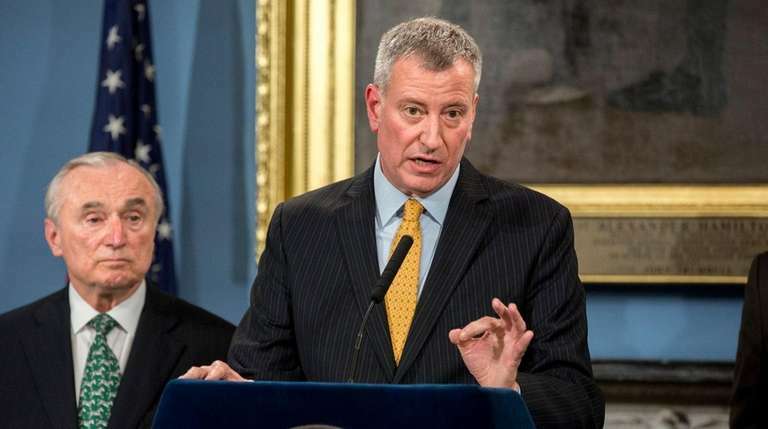 “When we see illegal gun crimes, investigations are going to be faster and more robust than they have been in the past,” Mayor Bill de Blasio said at a City Hall news conference announcing the initiative. Staten Island District Attorney Michael F. McMahon dubbed it a “Marshall Plan” for the city, referring to post-World War II aid to rebuild Europe. To get crucial DNA evidence from weapons and help build criminal cases, the city has earmarked $2 million for the city medical examiner to hire new analysts to test gun swabs in the search for evidence. De Blasio said an officer will be assigned to follow each gun case from arrest through prosecution, particularly in the 15 police precincts which have the most gun violence. “The division’s task is most simply to ensure the most dangerous individuals in this city are behind bars, it is as simple as that,” said de Blasio, who was joined at the news conference by state administrative judge Jonathan Marks, the city’s five district attorneys, the U.S. attorneys for Brooklyn and Manhattan, as well as NYPD Commissioner William Bratton and his top staff. Bratton recalled that in the 1990s the city had more than 5,000 shootings a year, but last year recorded slightly fewer than 1,100. Such a drastic decrease in shootings, particularly in the past three years, occurred despite a drastic drop in the controversial police stop, question and frisk tactics. Bratton chalked up the success to “precision” policing in going after high-value suspects. “Precision policing has to be accompanied by precision prosecution, arrests must lead to incarceration,” said Bratton, who in the past has complained about low sentences on gun cases. The latest data obtained from state Division of Criminal Justice Services revealed that in 2015 city prosecutors obtained convictions in about 50 percent of cases of criminal possession of a weapon in the second degree, the most serious such offense, with 42.3 percent being dismissed, including 10 percent in which prosecutors tossed out the cases. Judges sentenced those convicted to an average of just over five years in prison. The special gun courts will initially start in Brooklyn, where two judges, assisted by a hearing officer, will fast track cases in the hopes of either resolving them through plea bargains or what officials said would be an immediate trial.